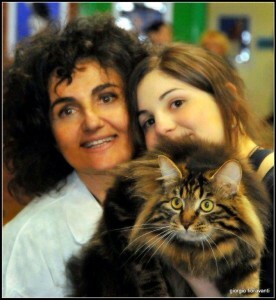 We are Catia & Lucrezia, mum and daughter. We have a small persian cattey, starting from a deep love for animals and in particular for cats. We live in a small village near Bologna (ITALY). We select persians for beauty, health and character. Our cats live in their own spaces in our house, they are toiletted every days, and we pay great attention to the quality and variety of their food. Our cats are tested and negative to FIV/FELV and genetic PKD. The most important “line of blood” of our persians are: BOBERAN, DIGIT, BOLO, BARMONT, HARWOOD, TOMBROCK, MARILÙ, STEEPLECHASE. A special thank goes to the breaders who gave us their cats to start breeding. If you would like further information about our sweet Persians or kurilean, don’t esitate to contact us! You Can find videos and info also on facebook in a page called “Mici di Lulu Cattery” Come and ho in us! !